The Undergraduate Science Building, situated in a central location in the Palmer Drive Development, will provide an innovative, technology-rich instructional facility for undergraduates. The building will be approximately 140,000 gross square feet on four floors. It will be situtated above the Palmer Parking Structure and will be supported by a concrete deck on the parking structure that will function as the foundation for the building. Just over one half of the building will accommodate teaching laboratories for the Department of Molecular, Cellular, and Developmental Biology and interdisciplinary science instructional space and support. The remainder will house the Undergraduate Research Opportunities Program (UROP), Women in Science and Engineering (WISE), the Life Sciences, Values, and Society Program, and undergraduate and graduate Neuroscience programs, as well as support space. In addition, there will be public spaces to create a welcoming environment for student and faculty interaction. 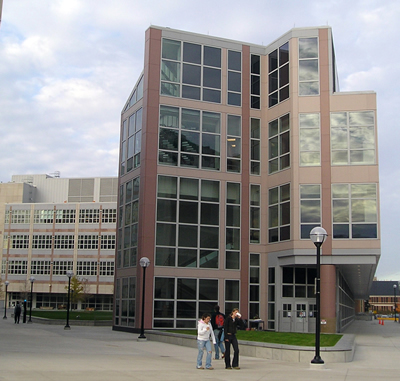 The exterior of the building harmonizes with the other two major buildings in the Palmer Drive complex: the “loft style” LSI Building and the Commons Building. The material palette will consist of a combination of stone, including brownstone, sandstone, limestone and granite, and painted metal panels, with painted aluminum frame windows.